Sharp MX-M1205 | The Miller Company, Inc.
An external Fiery® FS200 Monochrome Print Server with Command WorkStationn® s available for environments that need precision job management. Command WorkStation is fully integrated with the Sharp touch-screen for unmatched control and ease-of-use. 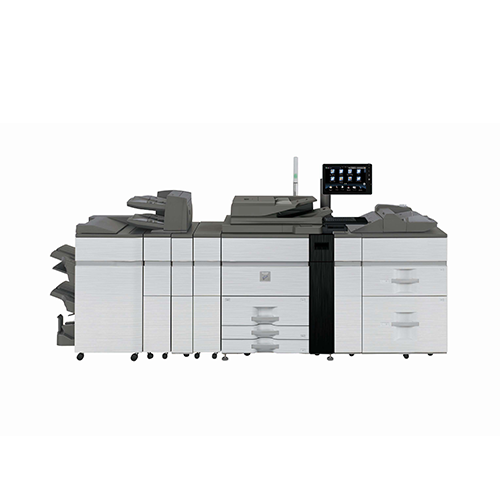 The MX-M1055 and MX-M1205 high performance monochrome document systems are the latest additions to the Sharp Pro Series light production lineup. Built on award-winning technology, these models add advanced workflow capabilities with EFI’s latest Fiery platform that helps set the bar for the ultimate in efficiency and operation. The new Fiery Print Server MX-PE11 provides in-plants and Central Reprographics Departments (CRD) with the advanced workflow capabilities they expect.